After a historic weekend where one of the country’s perennial football powerhouses welcomed a nearby historically black university, African American alumni from both colleges are incensed by viral pictures showing white fraternity houses draped in signs that are insensitive at best and racist at worst, disparaging the nearby HBCU. But the quote illustrates the fact that the indefatigable audacity of whiteness is as unavoidable as biological imperatives or legal mandates. Whiteness never naps, nor does it ever pass up an opportunity to show its supremacy. So when thousands of black college students and graduates gathered on the campus of Auburn University to celebrate Black Alumni Weekend, of course whiteness showed up to crash the party. And, like it’s biological mandate requires, it did it in the crassest, rudest way possible. On Saturday, the 7th-ranked Auburn Tigers welcomed the Alabama State Hornets for the first game between the two schools in their history. The game between the Historically Black College and one of the state’s largest predominately white institutions also served as the backdrop for Auburn University’s Black Alumni Weekend, an annual event started by a group of Auburn’s African American alumni, which include this writer. 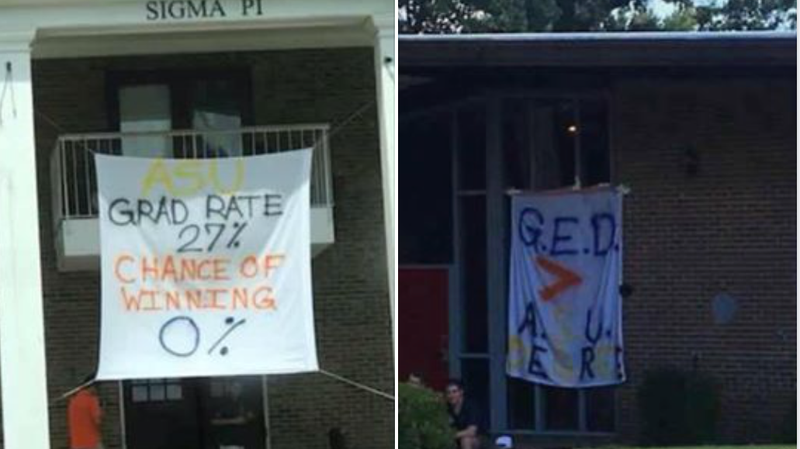 After the festivities ended, former Auburn student Matthew Fields posted pictures of two separate fraternity houses with signs displaying disparaging comments about Alabama State University. Students and grads from both colleges expressed disappointment at the signs. In a statement, Auburn University said: “Auburn University is committed to upholding a nurturing community supportive of fundamental dignities and promoting integrity, responsibility and mutual respect. We take seriously all reports of potential student conduct policy violations and investigate them fully to uphold the values and standards of the Auburn family,” according to the Opelika-Auburn News. Some black students have pushed back against the charges of racism, contending that signs disparaging opponents are a tradition among Auburn Universities white fraternities and not a sign of bigotry, as some have alleged. Some have argued that the graduation rate posted on one of the signs is accurate, while others point out that that HBCU alums often roast each other’s schools. Meanwhile, Auburn students come from families that earned a median income of $143,000, the second-highest median income in Alabama. Nearly two-thirds of Auburn students (65 percent) came from, families who make more than $110,000 per year, according to the Times. The difference between the two schools is that they serve two different constituencies. According to College Factual, Auburn’s student body is 6.6 percent Black and 80.8 percent white. Perhaps this is why the Auburn University, funded by a state whose population is 26.8 percent black and 69.2 percent white, needs to attract more African American students. And perhaps this is why Auburn invited Alabama State to play in the first place. Considering the reported $515,000 payday Auburn is reported to have paid Alabama State, that could go a long way in helping students at Alabama State, whose entire athletic scholarship budget was $565,820 in 2013-2014, according to the Montgomery Advertiser. And a game against Alabama State University might help Auburn attract and retain a more diverse student body, which is the entire point of having a Black Alumni Weekend in the first place. But that would be a lot to spray paint on a bedsheet and hang on a sign. It’s not as catchy as sitting in a multi-million dollar frat house and poking fun at the black kids. I may have added a bit at the end. Correction: 8/12/2018, 1:57 p.m. GMT: A previous version of this story incorrectly attributed the Phi Sigma Kappa banner to another fraternity that is actually not operating at the university.